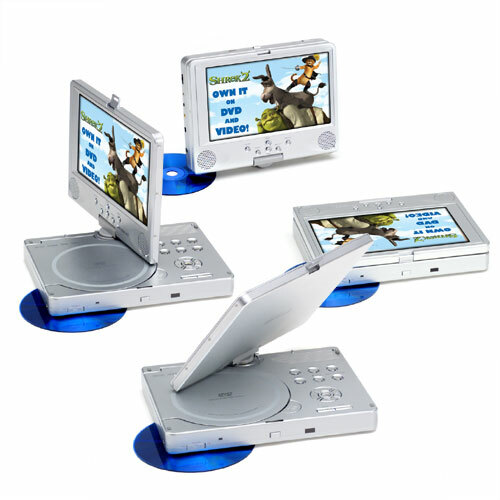 Excellent 8'' DVD player with Adjustable screen. Plays any region DVD, Pal or NTSC, on any TV or on screen, anywhere in the world. COMES WITH ALL CABLES TO USE IN THE CAR, IN THE PLANE, OR HOOK IT UP TO YOUR TV IN THE HOUSE. Large screen size is perfect for viewing movies in the car, plane or at home. And very compact and lightweight to carry around. Featured product. Ships within 24 hours. Standard shipping rate to all continental 48 states. Contact our customer service for the exact shipping cost to other U.S. locations and Canada.